The Balanced Body Center offers the most comprehensive approach to evaluating and treating bone density conditions (such as osteoporosis and osteopenia) naturally and effectively. These disorders are complicated and many factors contribute to their development. We will discuss the processes underlying the creation of healthy bone and the protocol developed by The Balanced Body Center to detect and correct bone density disorders. The entire process of bone remodeling is controlled by the osteoblasts as they produce products called RANK (which turns on the osteoclasts) and OPG (which turns off the osteoclasts). 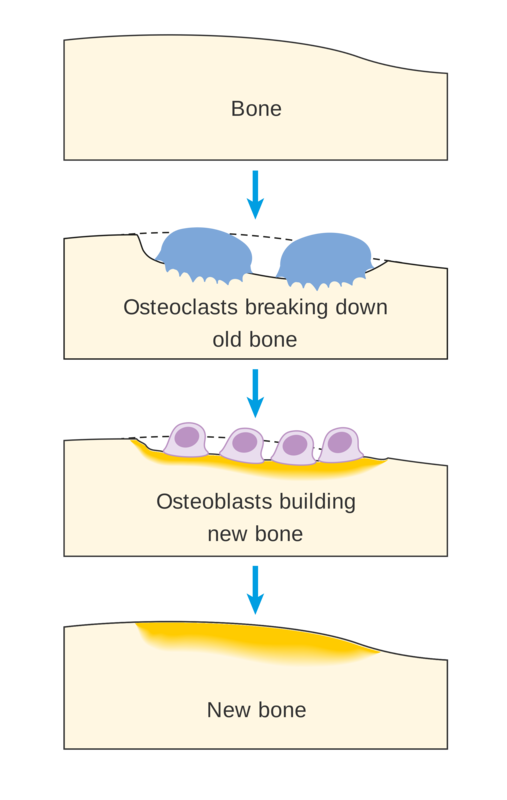 When it is time to build new bone, osteoblasts turn on the osteoclasts with RANK to take away bone. Once the bone is removed, the osteoblasts turn off the osteoclasts with OPG and then the osteoblasts build new healthy bone. Anything that disrupts this process can cause bone loss. Many factors can increase the amount of RANK in the system which ultimately results in increased bone loss. Some of these factors include systemic inflammation, hormone imbalance, toxicity, and acidity. The key to bone health is to determine and correct the disruption to the RANK system. 1. Ultrasound Testing: Our office utilizes state of the art ultrasound testing to evaluate bone density. Ultrasound testing provides a number of benefits over traditional bone density testing. Ultrasound technology allows the doctor to evaluate bone density without exposure to radiation. Additionally, this testing is much less expensive than traditional testing. Recent studies have demonstrated that the new ultrasound testing procedures are very accurate, providing the same accuracy as traditional testing without the need for radiation exposure. 2. Bone Resorption Testing: In addition to measuring bone density through advanced ultrasound, our office utilizes DNA based testing acquired from standardized blood samples to measure the rate of bone loss for our patients. The rate of loss is often more important than the amount of loss and can be a better tool to measure the effectiveness of therapeutic treatments. 3. Blood Chemistry: It is a common belief that calcium deficiencies can contribute to loss of bone density; however, the clinical picture is often much more complicated. Too much calcium or the wrong type of calcium can disrupt the calcium/phosphorous ratio, which can increase bone loss. Nutritional medicine must be customized for maximize effectiveness. Our office utilizes an extremely comprehensive blood chemistry panel and orthomolecular analysis to determine an individual’s specific nutritional requirements. Once this is completed, our office can determine what type of calcium is likely to be effective and if other minerals are required such as magnesium, potassium, boron, manganese, and/or Vitamin D.
4. Inflammatory Blood Testing: It is essential to determine how much inflammation is present in the body since increased immune reactions can drastically increase the rate of bone loss. Many factors in a patient’s history and blood chemistry can reveal the level of inflammation. Once the cause is determined, natural alternatives can be very effective to help reduce inflammation. 5. Gastrointestinal Permeability: One of the most common causes of bone loss is ineffective absorption through the gastrointestinal lining. Many factors such as leaky gut syndrome, abnormal gastrointestinal flora, systemic yeast, delayed food allergies, altered pH, increased bowel transit time, constipation, and frequent diarrhea can minimize the body’s ability to absorb nutrients. Our office offers delayed food sensitivity testing, systemic yeast testing, gastrointestinal permeability testing, and pH testing to identify each patient’s individual needs. Once identified, natural solutions to these conditions can be pursued to restore normal gastrointestinal function and improve bone density. 6. Heavy Metal Testing: Many people do not realize that heavy metal toxicity can interfere with the body’s normal usage of minerals. In fact, many elements such as aluminum, mercury, and cadmium can displace other vital minerals that are necessary for good bone density. Air pollution, cosmetics, water contamination, and other factors can often introduce high levels of these toxic elements into an individual’s system, resulting in a variety of health conditions including loss of bone density. 7. Thyroid & Neurotransmitter/Hormone Imbalances: It has been well established over the years that hormonal balance is crucial to good bone density. Despite this knowledge, many factors continue to be overlooked in the treatment of bone density disorders. Our office utilizes advanced thyroid blood chemistries, male and female hormone profiles, adrenal testing, and neurotransmitter testing to reveal the hidden causes of these disorders. Proper evaluation can reveal slight thyroid imbalances, reduced DHEA, increased cortisol, metabolic syndrome, decreased serotonin, hypoparathyroidism, hyperparathyroidism, decreased estrogen, decreased testosterone, and many other factors that can contribute to and/or cause a loss of bone density. It is essential to restore balance to these systems naturally to ensure recovery from bone density conditions. 1. Targeted Physical Therapy: Regular exercise can be one of the most effective tools to combat loss of bone density. Our physical therapists design individual exercise programs for all patients suffering from bone density conditions. This usually requires a short number of in-office visits followed by a home therapy program. 2. Dietary Changes: All of our patients receive a dietary evaluation to determine what changes can help improve health and bone density conditions. Small changes can often be extremely effective in helping to manage and improve these conditions. 3. Structural Care: Understanding the physiology of bone is essential to understanding the relationship between proper structural alignment and good bone density. Postural imbalance can increase the strain on weakened bones and increase the risk of fracture. Additionally, structural misalignment can create increased pressure on vertebral bodies, causing alterations in the body's normal electric charges, thus hampering the effectiveness of osteoblasts. The Balanced Body Center’s Bone Density Program includes a complete review of each individual’s condition. The appropriate tests are recommended and evaluated, and the cause of the condition is treated naturally.